Clean and crisp-looking, printed on high-quality paper, spiral-bound for ease of placement, and beautifully notated, this 80-page book screams, “I belong on your music stand!” And it does. Madsen, longtime trombone professor and coordinator of jazz studies at the University of Nebraska Omaha, noticed the growing presence of iRealPro in the jazz community. This inexpensive app, available for iPhone, iPad, Android, and Mac OS X systems, provides play-along tracks at any tempo, in any key, in many styles, repeating as desired—and shows editable chord symbols as well. Though typically used for improv-practice, he foresaw its value to the non-improviser as well, joining its backup tracks to essential and exploratory warm-up routines that not only lessen the monotony of certain exercises but also offer aural references of flexibility, tone, endurance, time, intonation, voice-leading, and style to any trombonist in the process. Once the app and a few needed tracks are in place, you need only choose one of the many warm-up routines found in the book; and enjoy! Contexts include the blues, minor blues, the chord-changes to Song for My Father and Well You Needn’t, and seven duets. Scored entirely in bass clef, the range generally spans F up to b-flat1, and a rare d-flat2, with occasional lower material for the tenor-bass trigger range, plus an infrequent pedal tone—in short, playable by a serious high school trombone student. Yet the goals above will address more-experienced players as well. 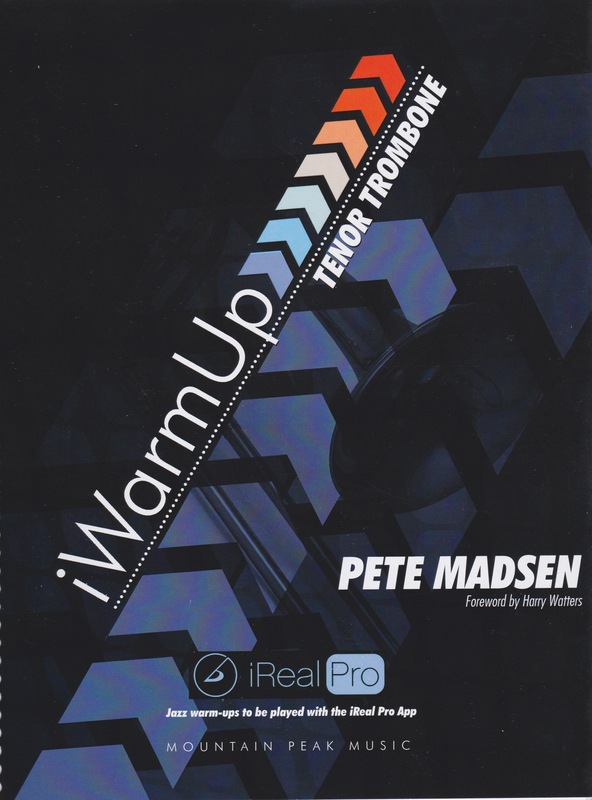 Madsen’s exercises are useful with or without iRealPro, and the book encourages musicianship at every page-turn. He details each etude with articulations, dynamics, alternate-position markings, and additional prompts. Classical players will receive a fine warm-up in a new environment. Jazz players get their workout in a more familiar setting, with the option at any time to branch out into improvising over the accompanying chord changes, which could be printed just a bit larger on the page for challenged eyes. Anyone prone to cutting short such exercises will find that the tracks serve to encourage them to press onwards. Also available in a bass-trombone edition, one can imagine future versions for trumpet, tuba, horn, or even woodwind or string instruments. Meantime, we are the fortunate community that gets to benefit first from this superb book!